1.5 Inch custom refrigerator circle magnets 20 mil can be employed for positioning your brand amongst the target customers. This custom refrigerator magnets are easily accepted due its circular shape, which means your business information is going to be accepted, too. This magnet can be availed at lowest investment and marketers can get it done beautifully with louder or bolder symbols to grab attention. This circle shaped custom full color magnets are refrigerator safe and can be offered during tradeshows or fundraisers or any other mass promotional event. Attractive price savings can be availed on bulk orders of this circle shaped magnet. 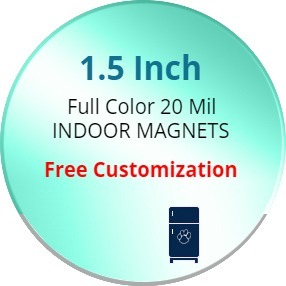 Request a quote to know price savings that offer on bulk orders of 1.5 Inch custom refrigerator circle magnets 20 mil.